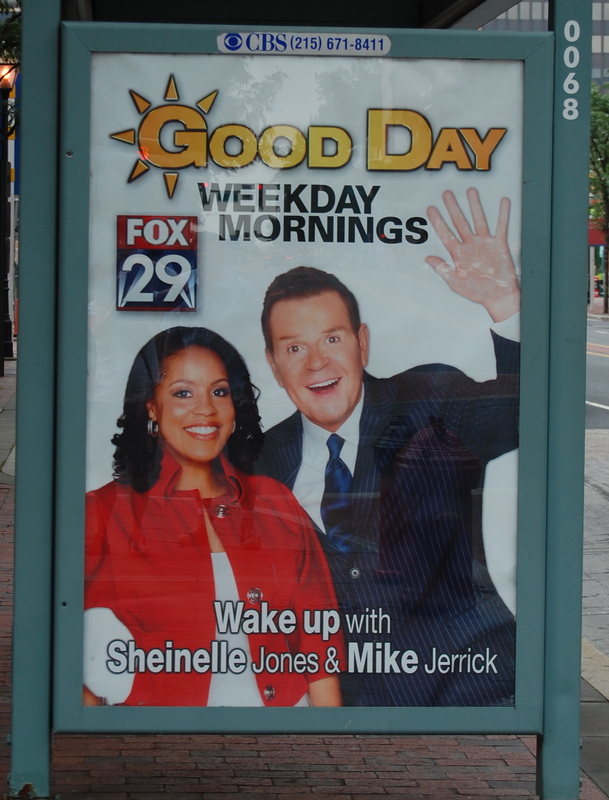 As we were walking around Philadelphia this weekend, I couldn't help taking a picture of an ad for the local news show. I've never seen the show, but the formula is so predictable. Sheinelle reads the news about fires, rapes, abductions, and mistakes made by social workers and other government employees. Mike's job is to report the humorous and the weird stories. He throws in goofy jokes, and Sheinelle rolls her eyes at him. When I taught media politics class, I had a mandatory assignment to watch one local news show, because none of the students had ever seen one before. It was really no loss. Our local news runs a special every Tuesday called “This week in careless smoking” so it can re-use the best films of fires. I truly believe (and have for years) that local television is the worst TV created in the US. So horrible. The only time I enjoy it is when there is a tornado passing through and they call in all the weathermen from all the shifts for a super weatherman conference. They are so serious, shirt sleeves rolled up, ties loosened, glued to their super doplar radar. Can’t get enough. Actually, it’s mostly just traffic and weather. I can’t think of anything else, I’ve seen on there. The very handy “what your child should wear to the bus stop” weather segment runs a solid 90 seconds and they run it every 10 minutes. In case you were wondering, that’s 80 seconds longer than it takes to stick your arm out the front door.